I've said it before, and I'll say it again: this year the awards belong to The Artist. Having already performed well at the Golden Globes, it is inevitable that this film will go on with the same success at the upcoming BAFTAs and Oscars. I'd confidently put money on The Artist winning the best film award for both of these ceremonies. Whilst I'd love to see Lynne Ramsay's incredible film We Need to Talk About Kevin win this award as one of, if not my favourite films of last year, however I'm putting my money on Tinker, Tailer, Soldier, Spy to win this one. Also on of the year's best films, Tinker, Tailor featured an incredible cast, soundtrack and cinematography to create a truly fantastic adaptation of John le Carré's bestselling novel. If there is any justice in the world, then this award will go to Pedro Almodóvar's incredible horror piece The Skin I Live In. Also one of my top films of 2011, Almodóvar's film will genuinely leave you exiting the cinema in a state of psychological trauma - and as my roommate said as we left the cinema: "have you seen the Human Centipede? Yeah, this film was worse than THAT!..." The clear favourite to win the best documentary award is by far and away Senna. I'd be very surprised if this film doesn't win the award here after the critics and general audiences, and racing fans and people who had never even heard of Senna alike were blown away by such a moving film. It is interesting to note however that the film failed to make onto the Oscar nomination longlist for the best documentary in what was a rather controversial move by the Academy - so the film definitely won't get an Oscar, but it'll be the favourite to win here. Tintin to win-win! The Spielberg directed picture was a return to form for the world's most famous film director, with a fantastic adventure film that harkened back to the days of Spielberg's earlier works, in particular Raiders of the Lost Arc. Having just won at the Golden Globes for the same category this is my favourite to win here too. The Artist is in my opinion going to be the inevitable big winner this year, so the odds of the best director award going to French filmmaker Michel Hazanavicius look pretty good; and it'd be a justified win too though, after all it's no easy task to make a new film that looks like it was made nearly a decade ago, especially one of this standard. Another tough category, but I'm going to predict that the highly succesful Tinker, Tailor will fly the lfag for the British film industry here and win this award. Although if anyone of these tough competitors can give it a run for its money, then it'll be Moneyball which was written by one of the best screenwriters in Hollywood today: Aaron Sorkin. Critics have appeared to be a bit hit and miss in their reviews of The Iron Lady, but despite whatever they may think about the film as a whole, most seem to be in agreement that Meryl Streep's performance as Maggie Thatcher seems to be a winner. Although I'd love to see Tilda Switon take it for her role in We need to Talk About Kevin which was one of if not my top film of the year. For me there are no real stand out winners here for this category, it really could go to any one of these five nominees. As a complete stab in the dark, I'd instinctively say that it would go to either Jim Broadbent or Kenneth Branagh, possibly Philip Seymour Hoffman as a bit of a dark horse, but I think if I had to make a bet on it, I'd put my money on Broadbent. Once again, just like the previous category this could go to anyone in this category. Although if I were to make a guess I'd say that the award could possibly go to Carey Mulligan, a young and talented British actress who has quickly risen the ranks to become a very well-known and much sought after actress in the industry. Whilst the great John Williams is nominated for War Horse, and Tinker, Tailor featured a fantastic soundtrack from Alberto Iglesias, the award will go to The Artist (as will most) as let's face it, in a silent film the music become even more important, and this film work with that skilfully. You know what, I'm gonna give The Artist a break here (despite also having great cinematography) and say that the award for cinematography will go to Tinker, Tailor, Soldier, Spy which in my opinion would well and truly deserve to win this award with its incredible cinematography. Yet again this one's anyone's award to win. Whilst I'd love to see Tinker, Tailor win this award with its fantastic set design and use of mise-en-scene, I'm going to put money on it going to the final film in the Harry Potter franchise which does deserve some sort of nod at these awards for what it's done for the British film industry, and its extravogant fantasy sets do do a very effective job in bringing the world to life. Once again, all of these nominees are worthy contenders and could easily take home this award. Usually this sort of award can be expected to go to some sort of period drama in which creating such a wardrobe of costumes is no easy feat, which puts Jane Eyre into the spotlight. Although despite this, I find it hard to resist putting forward The Artist again.... actually I've just changed my mind; period drama - the award goes to Jane Eyre. The Artist - although there is sort of irony about a silent film winning the award for sound! All of these films feature fantastic special visual effects, but the award will almost definitely go to Harry Potter, just on principle really - with the success that it's brought to the British film industry and as this is the last film of the franchise as well. I'll admit here I have no idea! I've not seen any of these films nor have I even heard of any of them! Hang on, brb, Googling.... Ok so I just found trailers for the latter two, and whilst Bobby Yeah featured some pretty cool stop motion animation, A Morning Stroll had a very cool and unique stylistic look to it and most importantly - a catchy little soundtrack! Finally reached the final category, it's only taken me a week to do so! Ok so this one's voted for by the public, and whilst I think all of these guys are great and upcoming actors and directors, Chris O'Dowd will undoubtedly get the public's love after starring in the incredibly popular and much-loved TV series The IT Crowd. Agree or disagree? 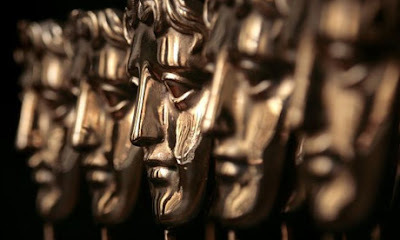 Leave your comments below on what you think about the BAFTA nominations and who you think will win!